My husband always thinks of something different for Anniversary presents and one year he gave me some Happy Hens. These little darlings are made in Portobello in NZ. I have even seen them in fabric. These are my happy hens. The girls are gentle, unobtrusive, great insect controllers and scrap eaters, not to mention the deep, golden eggs they produce. Oh I love your happy hens, they are so, well happy! 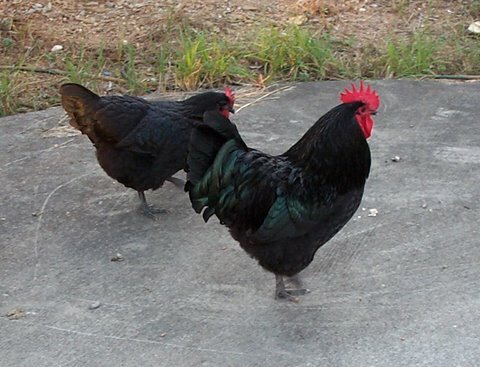 What sort of chickens are these? I am new to chicken owning but they have started to lay this past week and it is so exciting. I was only thinking today that they are treasures with all of their little traits and the way they turn our food scraps and vege peelings into delicious fresh eggs. Your hens, both china and real are gorgeous. Thank you so much for sharing them as part of Tuesday Treasures. I love happy hens. They look the same as plates I have. I love your chooks, both real and ornamental. I find that chooks are always contented. Your happy hens are very cute on their shelf. Our girls are getting on a bit now, so don't lay very much, but they are still wonderful pets. Lucky you , I'd love to have some Happy Hens!